Not all weld discontinuities are weld defects, but all weld defects are discontinuities. Understanding the difference will let you know if you need to scrap a part, repair it or simply add more weld. There are many codes depending on what type of product you are welding on. The codes are used as guidelines by manufactures to write their own specifications. Just because a certain Code allows for a certain amount of porosity, a manufacturer may not allow its suppliers to have any. 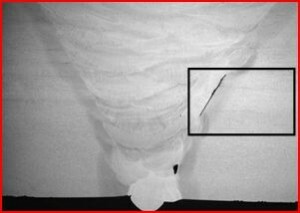 Porosity is one of many weld discontinuities that we must avoid. The list of weld discontinuities below can all be detected visually. Visual inspection is the easiest and least expensive of all non-destructive inspection methods. The tools necessary to carry out a visual inspection are few and not expensive. Tools such as rulers, weld gages and magnifying glass are pretty much all you need. 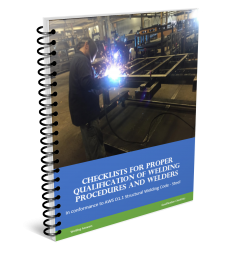 It is key that weld inspection takes place before, during and after welding. A weld discontinuity is a flaw in the weld. Discontinuities, as stated above, are not necessarily weld defects. They become weld defects when they exceed specified maximums of the code or customer specifications. This means that you can have weld discontinuities and still have an acceptable weld. However, we always want welds free of discontinuities whenever possible. 1. 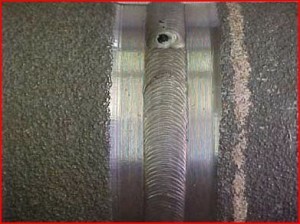 Porosity – Cavities in the weld caused by trapped gas during solidification of the weld metal. Common causes are lack of shielding gas, excessive arc length, or dirty base material. Another no so common cause can be arc blow, where magnetic fields cause an erratic arc. By codes or manufacturer specs porosity may be present but each individual hole should not exceed a certain length and the total length of all holes cannot exceed a certain value per inch of weld. 2. Lack of Fusion – Also called lack of penetration or cold lap. Lack of fusion refers to the base material not being fused properly to the other piece or weld metal itself. This is caused by having welding parameters that are too low. Although this cannot be detected, at least not easily, after welding, the welder himself can see this while welding. A trained welder is able to recognize if the arc is digging properly into the base material. It is difficult, but not impossible, to detect lack of fusion while welding. 3. Undercut – This is a grove that appears at one of both toes of the weld. This is caused by lack of fill. The lack of fill can be due to excessive voltage or too low wire feed speed. Can also be caused by incorrect welding technique. As with porosity, some undercut may be acceptable. 4. Incorrect Bead Placement – As the name states, this discontinuity occurs when the weld bead is not in the right location. It can mean missing the joint completely or not having equal legs in a fillet weld. Incorrect bead placement can be a weld defect if the root is missed or if the smallest leg size does not meet the specification minimum. 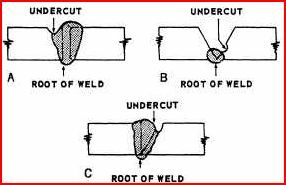 Undercut is a groove that is melted into the base material at the toe or toes of a weld. 5. Spatter – This are small drops of weld metal that escape the arc and land on the adjacent base material fusing themselves to it. Spatter is not a weld defect, but again the maximum allowable is per the customer’s specification. Spatter is caused by incorrect welding procedures, including amps, volts, welding speed, travel and work angles, and even shielding gas. Spatter does not decrease weld strength but it may create clearance issues and it looks awful. 6. 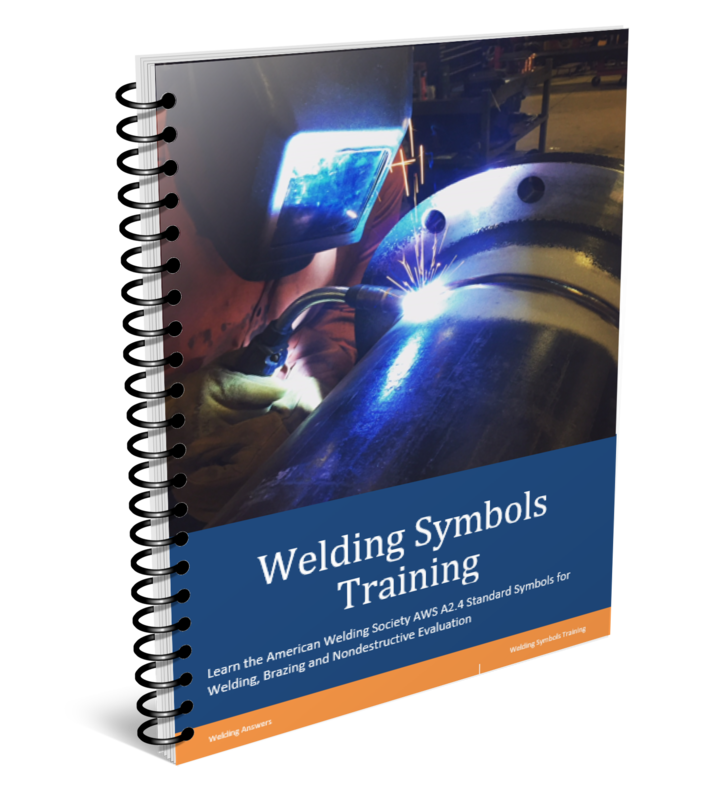 Incorrect Weld Size – This can be either a weld that is too big or too small. Although big welds are preferred over small welds it is still detrimental at times to have a big weld due to excessive heat input, weld stresses and distortion. Weld size is affected by travel speed and welding procedures, specifically wire feed speed. It can be easily measured by the use of weld gages. 7. 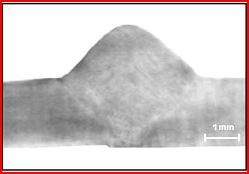 Slag Inclusions – This consists of slag trapped between passes. 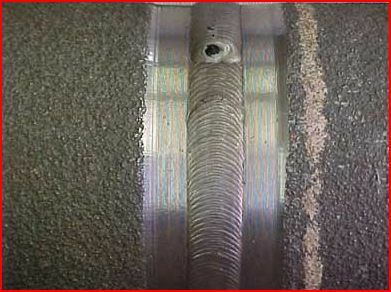 This is impossible to detect via weld inspection after welding is complete and very hard to detect while welding. Causes are inadequate cleaning of weld surface between passes. It can also occur in single pass welds when slag gets trapped in the root and toes of the weld. 8. Excessive Reinforcement – This is a weld that is too big or has too much convexity (too much build up). Usually caused by low travel speeds or incorrect procedures. Excessive reinforcement does not add strength to the weld. 9. 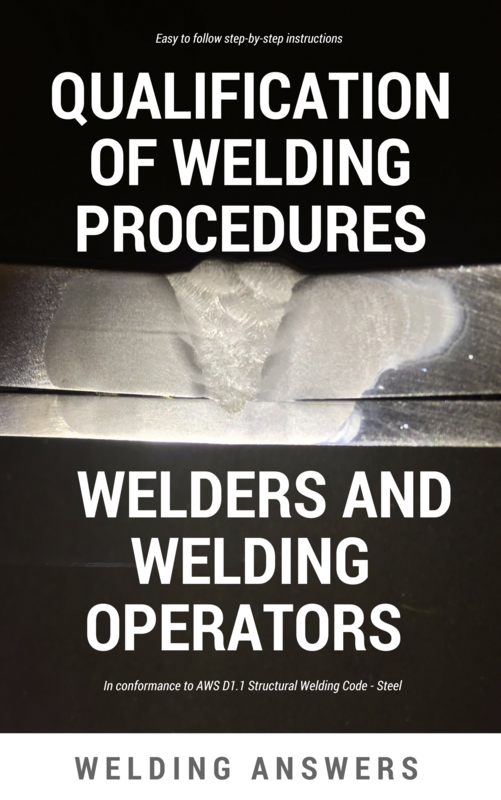 Melt Through – This occurs when welding procedures and/or technique provide too much penetration and metal comes out of the back of the joint. It will be welding specifications that determine whether any of the above are acceptable and to what degree. However, keep an eye out specially for lack of fusion, slag inclusions and incorrect bead placement. Even in small amounts these have the potential for weld failure. Do you weld? Which one of the above discontinuities gives you the most trouble? Hello Rod, craters are not desirable simply because they reduce the effective lenght of the weld. Since the desired throat dimension is not achieved in a crater, the portion of the weld that is a crater does not count toward the overal lenght of the weld. If you have a print calling for a specific weld lenght the crater will not count towards that lenght. You can find information on this in AWS D1.1 Structural Welding Code, it states that “all craters shall be filled to provide the specified weld size,exceptfor the ends of intermittent fillet welds outside of their effective length.” This means that if you have intermittent welds of 2 inches in lenght you can have a crater, but it must be outside of the 2-inch length. As far acceptance criteria in regards to the total sum of the length of all discontinuities that will depend on the code or standard your are following. This information will be in the code book of the specified standard (i.e AWS D1.1, AWS D1.6, ASME Sec IX, API 1104, etc.). On AWS codes look under the Inspection clause.